So is the Metal Men right leg Tina or Tin? Wasn't it confirmed that Clayface is actually a Toy Story 3 character? I've just gotten into this line and so far I'm lovin' it. I hope they re-release The Atom at some point. Noticed at TRU that the Batmobile has been repackaged with Blue Beetle (III) now. 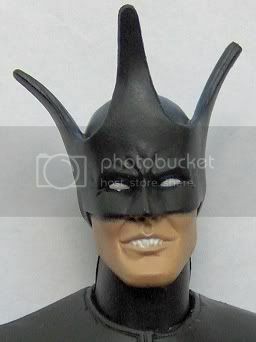 I just came across an Ebay listing for a used Man-Bat figure. Anyone know anything about that? That's a new one for me. Can't wait for the episode now! Forgive me if this is an obvious question, but do these Hong Kong figures ever a US release? Should I be snapping up any I see instead of waiting for them to appear in stores? They'll make it to stores, eventually. Most are "sneak Peeks", early production samples or "factory seconds" so if you are waiting for retail you will generally find them in a more "pristine" condition. That isn't so much an issue for my son and I as we just launch them across the living room and set them up like bowling pins anyway. But, in my experience, if you are patient and thorough enough in your searches, you can get most figures for about $4-5 on average including shipping. Not too bad as far as I am concerned. The bigger draws (like GL Guy, Bronze Tiger, Metal Men, etc.) are the shortpacked figures or figures that have only had 1 or 2 auctions and generally shoot up into the $20 price point. But, with the aforementioned patience, those prices will come down, or I'll just pick it up at retail.